The early National Letter of Intent signing period begins today and all four of Indiana’s class of 2018 commitments will sign with the Hoosiers. The first player expected to sign is South Bend Riley’s Damezi Anderson, who told Inside the Hall that he will sign at 9 a.m. on Wednesday at his high school. Anderson, a 6-foot-6 forward, is the No. 97 player nationally according to the 247Composite. Two other future Hoosiers will also sign on Wednesday. 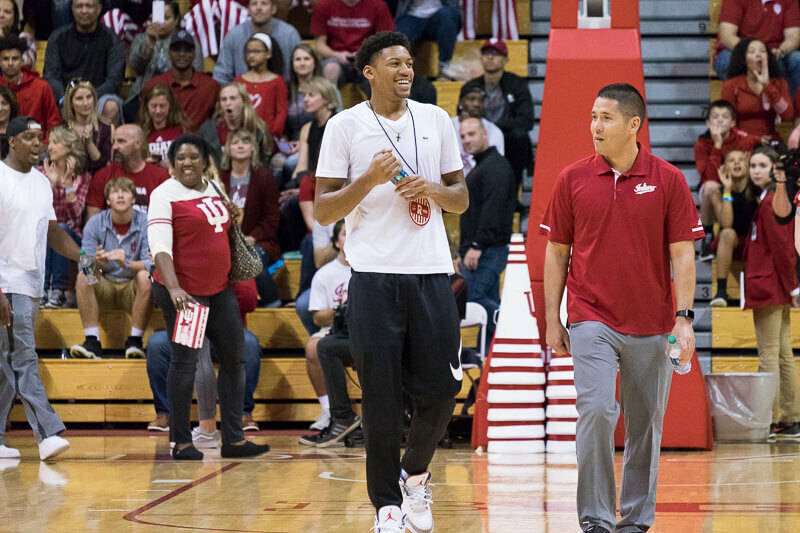 Jerome Hunter, the highest ranked of IU’s four 2018 recruits, will sign at Wednesday at 3 p.m. at his high school according to Ohio NOVA program director Andreas James. Hunter, a 6-foot-7 forward from Pickerington North (Ohio), is the No. 63 player nationally according to the 247Composite. Jake Forrester will also sign Wednesday at 3 p.m. at the Westtown School (Pa.), according to his father, Dwight. McCutcheon’s Robert Phinisee told Inside the Hall late Tuesday that he will sign on Thursday at 2:45 p.m.
Indiana’s 2018 recruiting class is currently ranked 12th nationally by the 247Composite and is fourth in the Big Ten behind Michigan, Maryland and Michigan State. The early signing period concludes on Wednesday, Nov. 15. These kids are ready and anxious to be Hoosiers, just the kind of kids you want to have not only are they talented but they truly want to be a Hoosier!!! Great job by Archie and the staff to get thes kids!! Now lets finish this class off by getting Romeo!! Go Hoosiers!! Soon to add: Darius Garland. I heard some buzz about his relationship with Schilling could play an important role leading towards his decision soon. But is there anything new, besides a good wish of his signing? Update: We will likely not be adding Darius Garland, Simi Shittu (5 star heavy vanderbilt favorite) has just cancelled his UNC visit for this weekend who was the only other team in the picture making him a lock for Vanderbilt, with Darius declaring within the next week hard to see a reason he would cancel his official visit without knowing that Darius also plans to commit to Vandy. I again would love to know where you get this intel. However, from the info you give it appears you are making several leaps and assumptions. True and I see Jerome Hunter having the potential to be a GREAT player. @ronmlarkey:disqus I am not sure how they are related. You could be right but he has been consistently saying he has not made a decision. Well besides the Rival report that indicates he is a Vandy lean, it may be because he sees IU with two really good future point guards Durham and Phinisee, Since he will probably be a one-and-done he may feel it would be hard to get playing time behind those two players? Is that really his last name??? I could just as well see it being interpreted the other way — that Garland doesn’t want another 5 star stealing his thunder so he isn’t going to Vandy. We’ll know soon enough. Don’t understand how Shittu cancelling a Kansas visit makes Garland a lock for Vandy. On another note, I’m a Valpo alum and went to the same church as Coach Drew while in Valparaiso. Love the guy and he would be incredible to play for if I was a prospect, but he’s killing me lately with the Garland/Romeo competition. I’d imagine every other school he is considering has a 3 star point or borderline 4 star on the roster lol, I’d also imagine and hope that Archie made it abundantly clear that he would be getting starting minutes as a freshmen because he is definitely on another level than any of the point guards on next years roster. Shittu has been heavy vandy lean. It is known Garland has made his decision yet not known when he will announce. If Shittu knows Garland will be going to Vandy, no need to visit UNC this weekend. Thats the logic, definitely not a good sign although still holding out hope. You are assuming that 1. Garland has made a decision when he states he has not, 2. Shittu’s not visiting UNC has something to do with other people, and 3. Shittu’s decision of schools has been made and is completely based on Garland’s decision which we know hasn’t been made. Did I miss any other guesswork? Garland’s dad stated today that his decision has been made and that he will announce Friday or Monday so no that is not an assumption. However yes, I am assuming that Shittu would not cancel a visit to one of the only schools he has scheduled an official visit too unless he knew Garland was going to Vandy, not too far fetched…not case closed either though. I keep on going back to what seemed like a very emotional experience for the Garland family while at Hoosier Hysteria. His mother was brought to tears if I remember events correctly. Shittu is a factor for sure but if you’re mom gets choked up while the crowd is cheering your name…that’s a factor, a powerful, emotional factor. I hope you’re wrong. Ah, but couldn’t there be other reasons that Shittu would cancel a visit besides any knowledge of Garland? Who knows, maybe I’m an optimist based the experience at HH and his dad’s high opinion of IU. unfortunately I agree but sine Romeo and Darius are close friends and want to play for same team, does this suggest he commits to Vandy as well? That is a possibility that scares me because Vandy is in the hunt for Romeo and if both Darius, Shittiu sign then Romeo could say hey why not and make Vandy a top 3 class. I am a NWI guy and Bryce is a good guy with lots of experience as a player and a coach, much like Archie. I hope as an Indiana kid his heart is with IU.